Your website visitors are no strangers anymore. Instead, they will be Lead records in your simply CRM. Generate webform and copy it to your website; As a result, your user’s information will be captured as leads in Simply CRM. You can create a new form or enable a existing form in your website to capture Leads into the system. This might interest your sales and marketing team members as it plays an important role in lead generation. A website with a webform is said to be easiest way to implement lead capturing strategy. To create one for yourself, you’ll need to fill in few fields — fields that are displayed in the webform and fields that are hidden intentionally. You’ll be navigated to Creating new webform view. You’ll find fields in two different blocks in this view. The fields in ‘Webform Information’ block are listed below. a. Webform Name : Provide an unique Webform name. This is just for your reference. b. Return URL : Provide a URL to which your users should be navigated after successfully submitting details. c. Status : Click on checkbox to make the webform active. You can disable the check-box if you decide not to use the webform. d. Description : To provide more details about webform. This is just for your reference. f. Assigned to : Select an user or a group to whom records should be assigned. g. Captcha : Enabling captcha will prevent your webpage from bots that may generate unnecessary Leads due to some automated script. It is highly recommended to enable this. The fields you’d select in ‘Lead Field Information’ block will be displayed on your webform when you integrate it in your website, unless you’ve removed the code from the HTML file. You can select fields — to be displayed on your webform — by clicking on text space provided next to Add Fields field. Mandatory fields are automatically selected. Round Robin Assignment : This option allows you to assign the newly generated leads from the webform to different users in your CRM. You can select the users on the right side in the Users list. After the last user has been assigned, the next lead generated is assigned back to the first person on the user list and the process continues. Add Fields : Add all the fields in the order you wish to have in your webform from the options provided. After adding you can again reorder the fields within the Add fields input box by dragging and dropping them. After the rearrangement, make sure you click the Save fields order button to save the sequence. a. Mandatory : Enable the checkbox to make corresponding field mandatory for the users to fill in. b. Hidden : These fields are generally used in tandem with Override Value. It’s purpose is to have a fixed value for a field when a record is created from the webform. For example, if you want to know which Lead came from which source, you need to select the Lead source field part of webform ,but make it hidden and select an override value. Now when user submits the form, he can not see the Lead source field (as it is hidden) and when it creates a Lead it will show the Lead source as that value which was selected as override. c. Field Name : Fields selected in Add Fields field are displayed in this column. d. Override Value : The value you would provide here will override the value entered by users. e. Webforms Reference Field : This will come handy while mapping with other CMS like WordPress. The field name must match the Webform Reference Field. If you would like to map existing forms with simply, the field names in your existing forms should be changed according to the Webforms Reference Field name. The values will be found in detail view of your webform record in simply CRM. For instance, First Name will be termed as firstname in Webforms reference Field. 6. Now click Save to update changes. After save, two fields are automatically updated in the list view. After successfully creating a webform, you will be navigated to the detail view of Webform. Click on Show Form button and copy the HTML content to your website. Done! Your website visitors are now gonna be Lead records in simply CRM. Your existing form might have different field names. The names should be changed according to the Webforms Reference Field name. The values will be found in detail view of your webform record in simply CRM. This feature enables you to integrate WordPress forms with simply to get leads right away into your simply CRM account. The process of mapping fields is made simple and straightforward. You’ll need to map fields according to webforms reference fields as shown in the picture below. Install cforms in your wordpress account. Create a form, Add fields and set them according to simply CRM Webform Reference Fields. Include Public Id along with the fields. For instance, If I have fields like First Name, Mobile, Last Name, Organization and Email in my wordpress form. The Webforms reference fields will be firstname, phone, lastname, company and email respectively. Use custom input field NAMES & ID’s. Send form data to an alternative page, and paste your Post URL in the text field provided. Click Save and Update form Settings. Public Id and Post URL will be found in the detail view of your webform record in simply CRM. Publicid should be hidden while creating a cform. Webform reference field should be copied from simply webform to cforms. The Webform reference field for Public Id field should be publicid. After setting the things up, you have to create a post to see the wordpress webform. 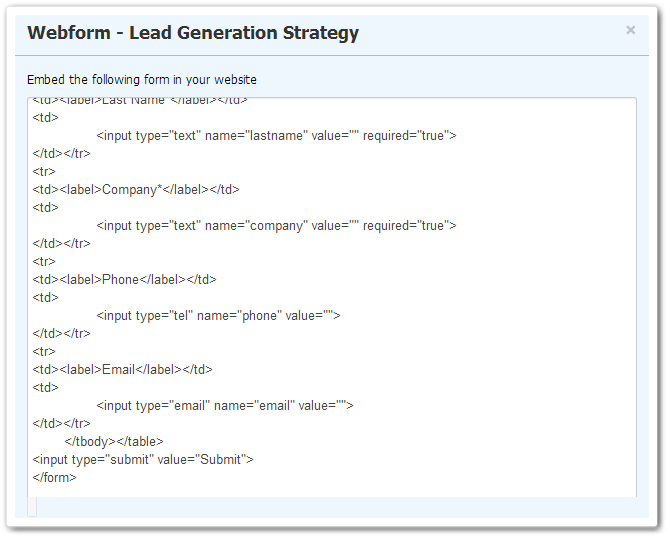 You can embed the webform in your website and capture the Leads into simply CRM, automatically. Select your form and click insert. If you would click on view post, you should be able to see your form. Your website visitors are no strangers anymore. They will be your Lead records instead. Need more help with Simply CRM? Copyright © 2012-2014 Simply CRM. Developed by Simply Consulting.